MSNBC host Chris Matthews blasted Special Counsel Robert Mueller Friday night after his report recommended no new indictments against President Trump or his associates. Matthews was visibly angry during a conversation with his panel, as they discussed past indictments and the investigation that has lasted about two years. He brought up the infamous Trump Tower meeting and the multiple meetings with Sergei Kislyak, the Russia ambassador to the United States, at the Republican National Convention in 2016. "All these dots we are now to believe don't connect," Matthews said. "Well, that's the conclusion in front of us, Chris. All that stuff was suggested. It didn't prove anything. In fact, the Trump Tower meeting, my reporting tells me was a bust. They didn't actually hand over any incriminating information," NBC reporter Ken Dilanian said. "What it showed is that Donald Trump Jr. was willing to accept help, but we saw no evidence that they actually accepted help—hacked emails or analytical stuff, all that stuff. It never panned out." 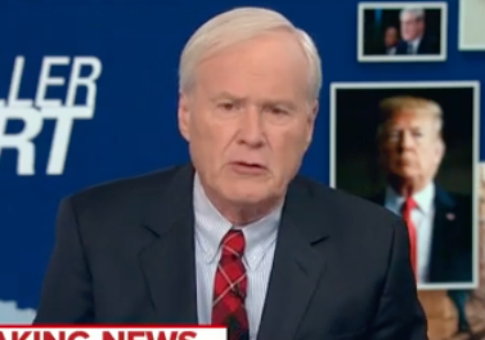 Matthews went on to sternly ask why there wasn't an interrogation of Trump and added, "How can they let Trump off the hook?"